Times Warner has tried to appropriate a trademark for Quidditch. See Studio trademarks ‘Quidditch’ lingerie and other similar stories on the web. Quidditch fans will be grateful to Times Warner for including footage of the World Cup in a recent Harry Potter film. The sequences of Hogwarts inter-house competition matches, though staged and definitely ‘little league’, nevertheless promote the sport, particularly amongst Muggles. 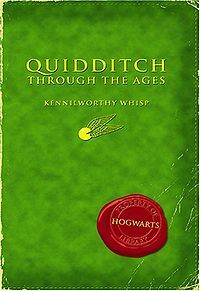 That said, wizards have been playing Quidditch for centuries as documented in Quidditch Through the Ages by Kennilworthy Whisp which discusses the game from the 14th Century onwards. Thus Times Warner claiming a trademark on the term is akin to the producers of Field of Dreams claiming rights to baseball or that of Rudy, the Longest Yard, Remember the Titans or Invincible claiming rights to American Football. Shame on them.